Published by York County Heritage Trust. Released 2006. Local resident, photographer and writer, Scott Butcher, has written several visitor guides, contributed to area Web-sites and is a living history volunteer for The York County Heritage Trust. 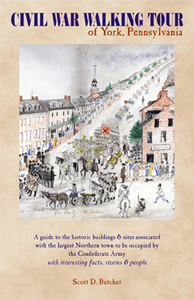 This informative walking tour booklet highlights 21 Civil War points of interest in York. It also contains little-known "facts, stories and people" relating to the conflict. A must for Civil War buffs, students of architectural styles, and those interested in York's rich history. Purchase Civil War Walking Tour of York, Pennsylvania.